Kathleen Robertson, Cindy McKee and Kiersten Pecchia, from Forres, will embark on a two-day cross-country skiing marathon in the Arctic Circle to fundraise for Walk the Walk. Their trek will take them to Sweden later today, where they will journey through Abisko National Park. All three have never taken part in the sport before but have underwent a training regime beforehand to better equip themselves before heading out to the bitter cold. Mrs Robertson is looking forward to the exciting challenge. She said: “Last June we came up with the idea to each raise £750 between us and so we held a series of events last year which helped us beat that target by quite a lot as we made £11,500 and we can’t believe how generous people have been. 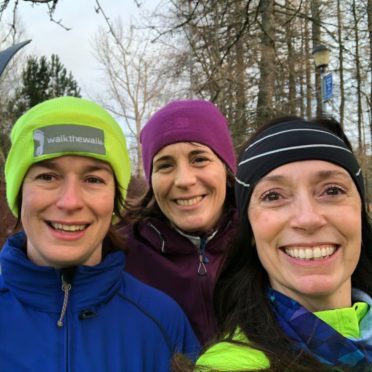 “We signed up for the Arctic Challenge and have underwent a three month training programme that had us power walking locally and then spend a couple of day cross-country skiing at the Huntly Nordic Centre. Mrs Robertson is a vet, while Ms McKee is a housewife and Ms Pecchia is a doctor and they organised events last year such as the Breast Fest, a music festival held in a back garden in Forres. They have self-funded this trip to take part in the challenge, with all three of them aiming to raise the profile of both breast cancer and the Walk the Walk charity. Mrs Robertson is mainly concerned about the major drop in temperature when they head over, as it could drop to us low as -20C. She said: “I’ve had a few friends who got breast cancer and they don’t start screening you for it until you turn 50 so we wanted to raise awareness.